The Micro-Block is a compact loudspeaker with extremely well-behaved sound dispersion and other very good sonic properties at a low price. 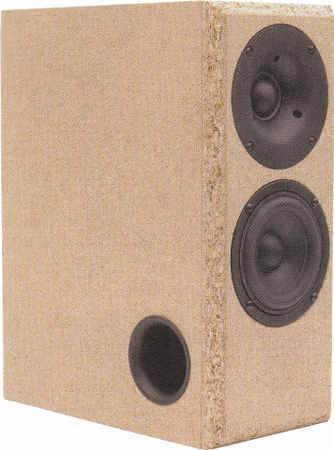 Bernd Timmermanns has developed this bass reflex speaker. The Micro-Block is home to a Wavecor dome, the TW030WA12, and the subwoofer SW118WA02. Its crossover consists of a low-pass and a high-pass branch each of second order, i.e. with a slope of 18 dB per octave. A resistor sits in series to the tweeter as a voltage divider. To give a slight lifting to the highest treble, a capacitor is wired parallel to that resistor. No components were needed for eliminating any resonances or bulges in the frequency response. We see a very even on-axis frequency response from 30 Hz to 30,000 Hz. The decay spectrum (waterfall diagram over frequency) is exemplary, free of any disturbing resonance. At 90 dB and 1 m, non-linear distortions remain below 0.4 % almost everywhere above 200 Hz. The high-end kit contains Mundorf MCAP EVO capacitors of which 2 are Silver Gold Oil capacitors. The coils are a Mundorf Hepta coil and a baked varnish coil for diminishing the microphonics effect. Current flowing through the coil creates a magnetic field which on itself sets the reel of wire in motion. That motion induces a voltage in the coil which adds itself to the original signal.